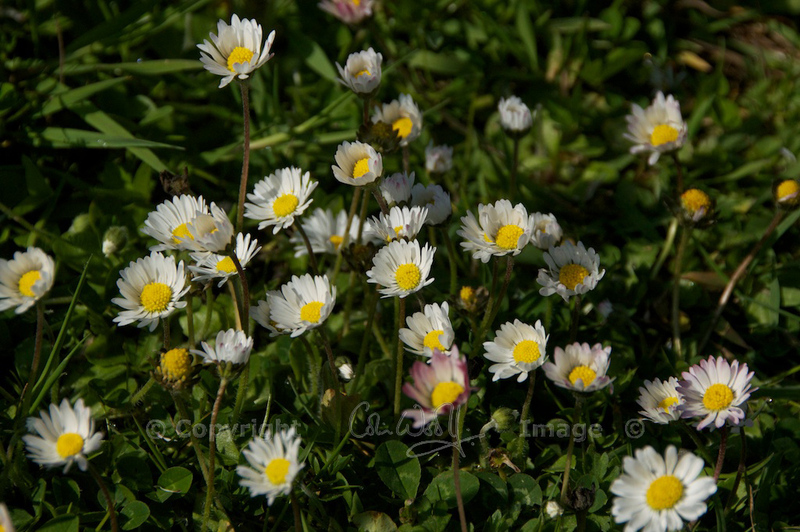 I can never see a field of daisies without wanting to make daisy chains! The word ‘daisy’ comes from the Old English dæges-eage, meaning ‘day’s eye’; in Welsh, it is called ‘llygad y dydd’, ‘the eye of day’. This is because the flowers open at dawn, their heads tracking the sun’s progress across the sky. At dusk they slowly shut each ‘eye’ by turning their white petals inwards to make a cup shape. Daisies will only open in full sun, staying firmly closed in wet weather. This is the origin of the saying ‘as fresh as a daisy’, meaning someone who has slept well and is bright and ready to face the morning. We are also big lovers of daisies. We had our garden redone this winter, including new lawn laid, in which we’ve planted numerous wildflower plugs including two kinds of daisies. Yesterday my husband mowed the lawn – but before he did, he picked the 8 (yes, 8!) daisies that had come up, and put them in a little vase. We’re hoping that they will spread and spread. Haha, that’s dedication for you! How lovely! 🙂 For the last 2 years we’ve had a few orchids coming up in our lawn (it’s a fairly new one, as it’s a newish house). Colin mows around them very carefully! I had never made the connection between the saying and daisies closing up, but right enough! It’s such a childhood joy, making daisy chains, isn’t it? The necklaces began to droop rather quickly though, I seem to remember. I know – the day’s eye closing at night is such a sweet idea! I just love it. I used to make loads of daisy chains too. I used to try and revive them by putting them in a glass of water but you just end up with limp stems! It would be sad if they forgot things like this because they were too occupied with computer games! 20 or 30 years ago it was easier for children to be children. That’s good! All kids should learn! When you think of how many unbroken generations have probably done it, it’s amazing! Just to add my tuppence / two cents to the daisy chain discussion, my daughter (now 16) grew up making daisy chains, along with her friends. I’m sure this is because they went to a school with a grass play area – a rarity these days where most schools have nothing put paved or surfaced play areas. She loved lolling about on the grass with her chums at school, and daisy chains were a big part of that. She in turn taught the younger neighbours downstairs (who went to a school without any grass areas) how to make them on our shared drying green, which was a great producer of daisies. I do feel all schools should have a grassy area for children to play in. It doesn’t sound like much but it’s a way for children to experience nature. That’s really good to know, Christine, and thank you for adding this comment. I totally agree that all schools should have grassy areas for children to play in. We are so lucky that our two girls grew up in a rural area where the countryside was their playground. Increasingly, I think we risk losing touch with nature, and I fear sometimes that we don’t value the connection enough, especially where children are concerned.